Whether you’re a manager trying to embrace a “whole person” philosophy of coaching and mentoring your reports, a business owner striving for a healthier workforce or an HR leader looking for ways to make employee wellness a reality, you’ve probably wondered about the most effective, practical, and affordable ways to promote health and wellbeing in your office. While some companies get lucky with exercise-obsessed, health-conscious employees (plus the resources to include gym memberships, fitness reimbursement, and other generous employee wellness investments in their benefits package), most organizations are trying to find ways to promote wellness without breaking the bank. Through our work with a wide range of clients at Myron, we have discovered some practical ways to use cultural factors, employee encouragement, thoughtful promotional products and other small investments to drive workplace wellness. Below you’ll find our four favorite ideas for promoting wellness in the office, and all the tips, tricks, and promotional product recommendations you need to make these strategies a reality. If you’re working to encourage health and wellness in your workplace, there’s an all-too-common practice that you’ll want to eliminate from your company: employees skipping or forgetting medications, foregoing exercise, or losing track of personal wellness because of the demands of the workday. You can address the simple problem of employees forgetting or de-prioritizing their health by gifting items like a wellness journal or a branded pill box to send a clear message that you want employees to prioritize their health on a daily basis. Encourage managers to feature these items on their own desks and give their teams a short talk about the importance of daily health and wellness practices. You could even offer employees the chance to sign up for an optional e-mail alert each day, reminding them to take their medications, do some stretching, or participate in daily health practices that are important to them. Problem: Employees de-prioritize exercise and personal care due to workday demands. Solution: Daily health reminders and managerial examples. No matter what steps employees take in their personal lives to stay healthy, their wellness, fitness, and job performance will all suffer if they’re not eating healthily and drinking plenty of water throughout the workday. If you see your employees yawning frequently or complaining about headaches and indigestion, or if a quick glance around the desks in your office reveals plenty of junk food and coffee or soda but little to no healthy foods or water, you may have a problem with nutrition and hydration in your workplace. One way to address this head on is to use whatever resources you have to increase employee’s access to drinking water and healthy snacks throughout your office. If you’re already investing in snacks and food for employees, use that money for the healthiest options possible. If any parts of your office space lack convenient access to cool, drinkable water, or if your water cooler is perpetually running low, make the changes necessary so that everyone stays hydrated. Nutrition and hydration are also another key area where managers can lead by example. If your employees see you carrying a branded water bottle to meetings, ordering healthy foods for team or client meals, and choosing healthier snacks throughout your workday, they will start to see nutrition and hydration as a key part of how you do business. Problem: Employees aren’t staying properly hydrated or eating healthily. Solution: Healthy food, ample drinking water and branded water bottles provided by the company. Every day, the vast majority of American workers have one thing in common: they commute. And while the word “commute” may carry negative connotations of sitting miserably in traffic or jockeying for position in a crowded bus or subway, it can also represent a key opportunity for exercise. 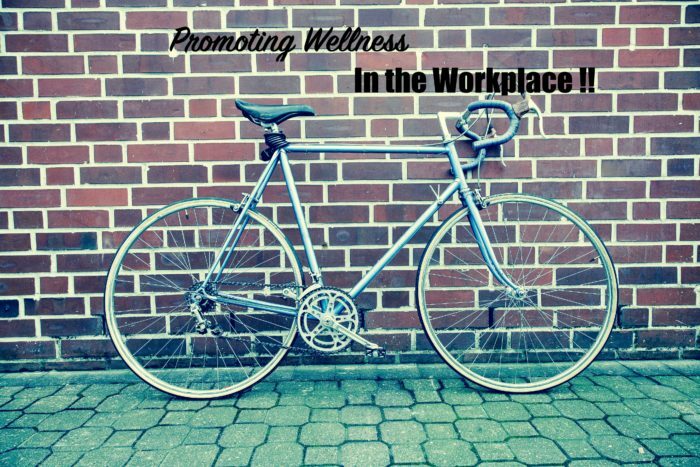 The members of your team who are currently choosing to bike, walk, or run to work each day are key influencers in your office: if you can celebrate their healthy choices and make it easier for others to follow suit, you will increase the overall wellness of your organization. One popular program to encourage commuting by bike or foot is to offer a monthly reimbursement for those commuters. You could also celebrate their accomplishments in your regular e-mails or all-hands meetings, maybe even by playfully framing the impressive mileage your cyclists, walkers, and runners are accumulating (“this quarter, Marcus completed the equivalent of the Tour de France!”, “by the end of the year, Sharon will have walked the length of the entire Pacific Crest Trail!”). Person-powered commuters often face genuine safety risks when they must commute in the dark, which can sometimes be inevitable, especially in winter months, so one way to encourage this practice is to give custom reflective safety items as gifts to cyclists, walkers, and runners in your office. Problem: Employees can’t find time to get exercise. Solution: Bike and foot commuters recognized, encouraged and equipped. While everyone at your company will have their own personal preferences for fitness activities, it is possible to create a culture in which a passion for exercise and all of the benefits it brings to personal wellness is shared by your entire team. If you have team members who share a love of working out, running, rock climbing, spin class, or any other fitness activity, you could encourage them to schedule syncs or one-on-ones at the gym. If your building features showers, you could start offering a towel service and supplying toiletries to make it more convenient for your employees to clean up after a pre-work or midday work out. You could also create a channel on your internal chat program for employees to discuss fitness, encourage each other towards goals, and invite one another to exercise together. At meetings or in company-wide e-mails, you can celebrate and congratulate employees who meet personal fitness goals or who enter races, walks, or fun runs (maybe you could even offer to reimburse their entry fees or make contributions to the charities their races support). Finally, if you’re going to invest in branded apparel for your company, consider choosing something more athletic and workout-friendly than the generic company sweatshirt or fleece. Giving your workforce branded athletic apparel that they can wear out on runs or workouts will send a clear message that you support their health, and it may also provide some free publicity as other health-conscious people in your community take note and wonder what it would be like to work for someone who invests in their employees’ health and wellness. Problem: Fitness is not an employee priority, or employees can’t fit their workouts into their workdays. Solution: Individual fitness goals supported and celebrated. Group fitness opportunities encouraged.